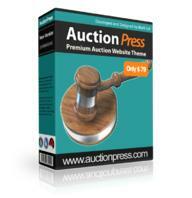 The AuctionPress theme by PremiumPress theme clubs is a theme using which you can start making market auction websites. It will help you transform the WordPresss to a wonderful auction website that can not only be customizes easily but will also allow your website visitors to edit, add, or manage their auctions. This WordPress theme is designed especially for making business, market website containing additional services and integration. You will be able to setup as well as customize the membership packages on your own and thereby charge your visitors when they submit their services and products to the auction website. AuctionPress allows members for private messaging where they can contact one another using your website for auction listing descriptions. The customized email alerts feature offered by this theme allows users to use the in-built email manager. They can setup their own customized email alerts which then can be sent to the users on different events like out-bidding, bidding, etc. Auction listing will allow users to setup options like buy now, reserve price, and so on. The users can also select the accept offers option using the ‘make an offer’ feature. The registration verification feature allows you to help protect your website visitors from illegal or fraud. It offers an additional security line with which you can decide manual checking as well as approve members before anyone can use the website. 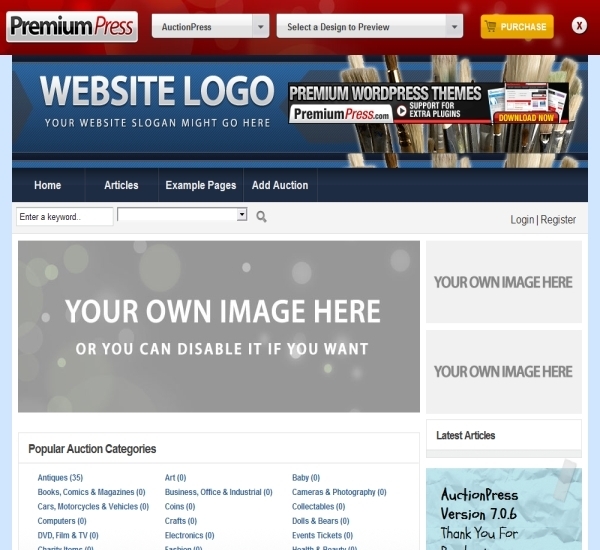 Auction listings which are unable to sell can easily be relisted with the help of member account tools feature offered by this WordPress theme. You just need to click once and the auction is ready and live in front of you with the exact setup options that were originally listed. The theme provides an in-built feedback system which allows buyers to offer a rating system to their sellers up to four stars. The customized featured feedback will display those stars on the seller’s profile. Instead of starting with some empty auction website, users can directly import products from eBay, which will help the auction website look busier. The theme is search engine optimized which will allow you to generate organic traffic for the website. The auction listings theme will allow users to setup a feature which will allow you to display search results right on top of the page. This will be assigned with the map address which can be plotted on the Google map. The theme features are very strong and fulfil all the needs and requirements of a food related website. The cost of the theme is very reasonable as compared to the number of features offered by it. It also provides some powerful SEO related features. Loading speed is not very good when many images and large amount of data is stored. The cost of this theme is quiet high as compared to the other competitor themes. The theme cost is $79.99.